For Rent - Year Round - ADORABLE AND AFFORDABLE! Enjoy country living and convenience in this 2 Bedroom FULLY and skillfully renovated home on .18 Acres with a 1 car drive under basement garage plus a separate carport. Located on a portion of old Rt. 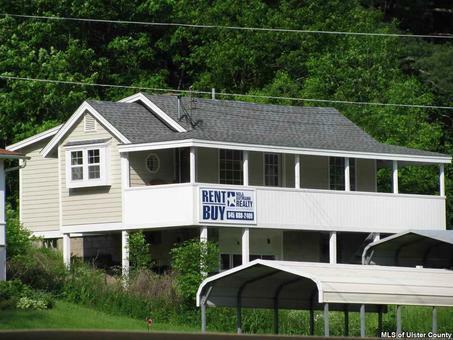 28, in Shandaken, NY and convenient to Trailways bus. Situated on a rise with covered porch overlooking Panther Mountain & Fox Hollow Mountain. Watch bald eagles soar over Esopus Creek. Features great room effect, garden bay window, all new appliances including new washer and dryer. Central to all recreation; skiing, hiking, shopping, theaters, etc. Front porch wraps around to backyard for easy access without using front steps. This home is owned by my husband and me. My husband and I are both Realtors, but his lifetime career was home building and he has totally renovated this home. Nearly every component of this house is either new or has been replaced, renovated or improved, inside and out. Totally New Kitchen including appliances and cabinets, New Bathroom and All New Appliances in Laundry/pantry area off kitchen. Home is also available for purchase for $165,000; ready to move into. I would be happy to show the home to you, at your convenience. Please feel free to call us with any questions you may have or if you would like to make arrangements to preview the home, our telephone #is: 845-688-2409. Thank you. Heating Fuel: Electric; Home has been fully insulated.